With a 12S LiPo battery pack, two 2.45 kW motors, and a brake pedal turned accelerator SouthernFried Chibi is a ton of fun that weighs in at around 30lbs thanks to its super light 8020 frame. 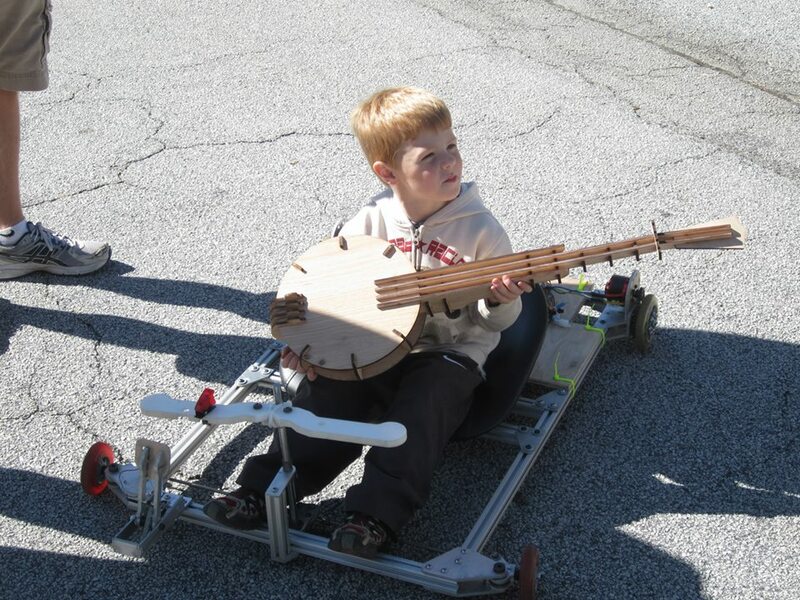 A small child enjoys the magnificence of southernfried chibi whilst wielding a wooden laser-cut banjo. As I currently understand it, this go-kart started as Xo Wang’s (geekshavefeelings.com) mission to build a Charles Guan (www.etotheipiplusone.net/) inspired go-kart in a weekend’s time. Fortunately for me however, Xo ended up not entirely finishing the kart and out of the goodness of his heart bestowed the project to me. While I was waiting for the electronics to arrive, I set about installing chains on the rear drive wheels. The chains utilized for this project were #25 size which is perfect for this power/torque range but makes things difficult when you need things like half links. Throughout the project I wasn’t able to find #25 chain parts anywhere locally which meant having to order chain parts from odd places in china and really long waits for new master links. As soon as batteries and controllers were in my possession, I laser cut a .25″ thick acrylic electronics tray and went about attaching the controllers and batteries to it (you’ll notice however that the cart now utilizes a wooden tray because the acrylic tray broke D:). I also wired up two male-to-female banana plug jumpers which allow me to connect the 3 LiPo batteries in series. Finally some banana plug Y’s (to connect the batteries to both controllers) were soldered, some shorted pins (to turn the controllers on) were rigged together, and a 5K pot was wired in to both of the controller’s “throttle” leads and everything was ready to go! There was much rejoicing and lots of silly go-karting inside of MRDC! You might notice in the video a loud clanking sound every time the cart accelerates. That clanking noise was the sound of chains not meshing properly with sprockets. Basically, the chains were skipping off of the sprockets #sadface. After realizing I was going to need totally new sprockets for the rear wheels, I put off the kart for a long time. 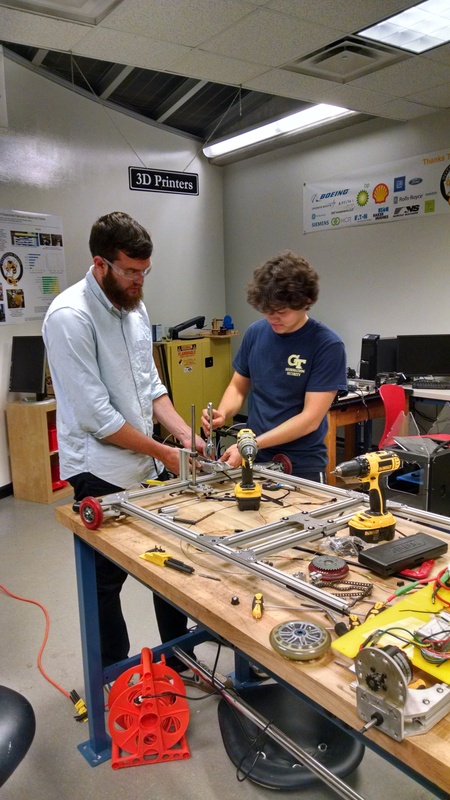 Instead of letting it sit around indefinitely however, I asked some awesome fellow University Lab Instructors from the GaTech Invention Studio to help me out. We all agreed on Atlanta Maker Faire for the new project deadline to force us to actually get the thing done. Joshua and Kuttler putting some work into the kart! I brought in new scooter wheels and cut some better sprockets out using our waterjet. Joshua Terrell and Kuttler Smith brought a whole bunch of hard work and elbow grease. Joshua and Kuttler essentially rebuilt the entire cart. 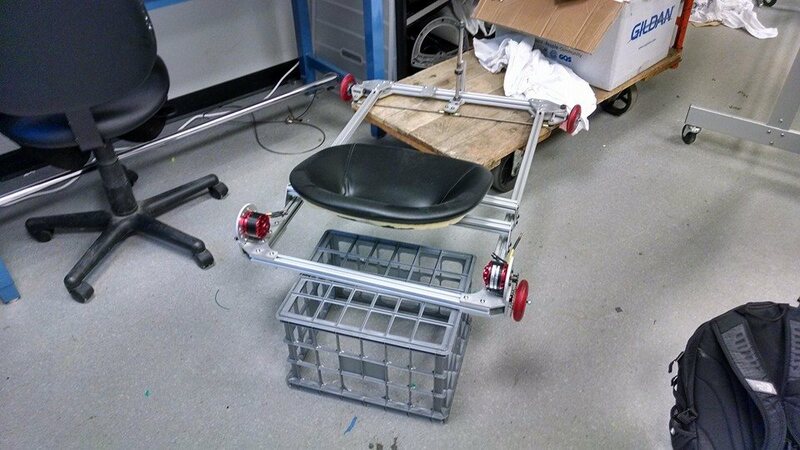 They remounted the seat to add more rigidity to the frame, made a woodern electronics tray, and a really nifty accelerator pedal. Xo originally made the pedal to be used for brakes but since we didn’t have brakes, Kutler rigged up a system of belts and springs so the pedal could be a “gas” pedal. I installed the new wheels and sprockets and the project was done!